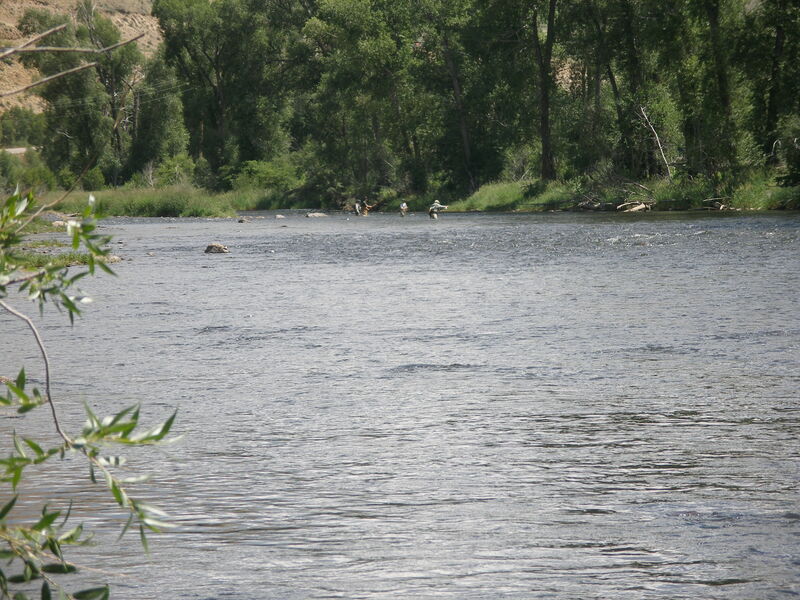 After a great day of fishing on Saturday and a great hatch, I was aching to return to the Colorado River, so I planned a return trip for Tuesday, August 5. I reached a good point at work to break away for a day. I left the house at 7:30 and arrived at the Kemp-Breeze parking lot at around 10AM. There were more cars in the lot than I expected for a mid-week day. I applied my insect repellent and dug some additional light olive-gray comparaduns and black ants out of my large fly storage box and placed them in my front pack. Two gentlemen were preparing to fish while I was in the lot, and they headed out before me. I crossed my fingers that they would go downstream and leave the area I love open. When I reached the river, I was disappointed to see a group of fishermen one hundred yards upstream as well as two fishermen just above the stretch that I target. But there was space at the tail of the run that I favor, and I entered. Rising fish were absent, so I tied on the yellow Letort hopper and a beadhead pheasant tail and began prospecting the runs and the areas behind rocks. In short order I caught a 12 inch brown on the beadhead pheasant tail. The guy above me left his position and returned to shore to pee, and then he walked back to the group 100 yards upstream. Around 11AM I started seeing more rises, but I was not noticing any mayflies, rather lots of dapping caddis. I tied on a size 16 deer hair caddis and experienced a few refusals, so I asked why not go to the olive-gray comparadun and see if that was what the fish were looking for. I tied on one of the new ones I placed in my front pack, but it was a size larger than what I used Saturday. The fly was not working, so I switched it out for the bedraggled fly that yielded a bunch of fish on Saturday. This produced two nice browns, but the deer hair wing was sparse, and the fly continually fell on its side, and this made it difficult to see. I clipped it off and tied on a new size 16 comparadun, and this proved to be the ticket. Meanwhile another fisherman split off from the upstream group, and he was methodically working downstream along the left bank, as I faced upstream. He was making downstream presentations and picking up a few fish. My path was now clear to cross to the far bank and fish upstream between the bank and the deeper run in the center of the river. 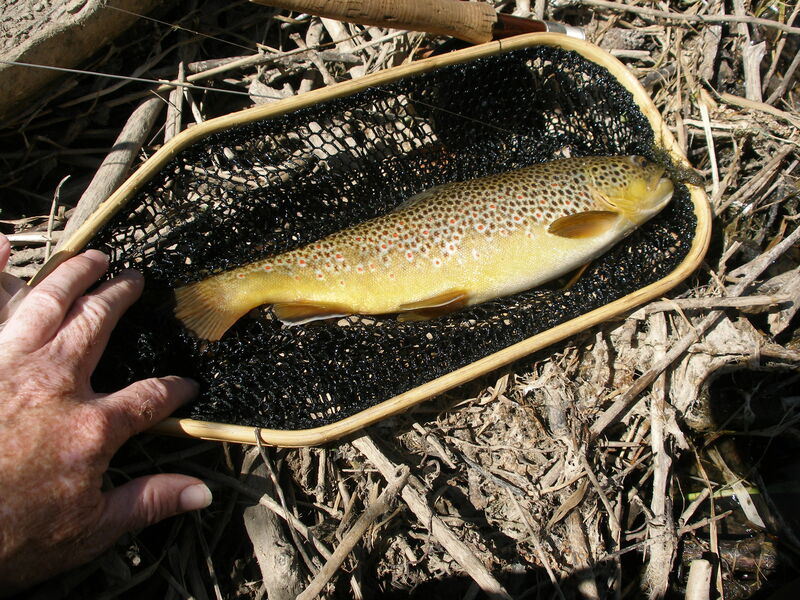 I crossed over and fished my comparadun to rises, and I caught ten browns by 1PM, when the hatch subsided. When I reached the top of the run where there is a shallow riffle area, I returned back to near my starting point and noticed some sporadic rises. I tried the light olive-gray comparadun over these fish, but I experienced several refusals. I noticed some small BWO mayflies, so I tied on a CDC olive and caught a 13” brown on that fly. I also connected with two other trout for a bit, but they escaped before I could play and land them. One was particularly sweet. I spotted a fish rising in some fairly shallow water near the bank behind a small rock. On the third drift the trout, which appeared to be decent size, sipped my CDC olive, but I played it for only a few seconds before it turned and got off the hook. It was now 1PM, and I decided to head back to the car and eat my lunch. I lathered up with more insect repellent after lunch, and then I returned to the same starting point. Some wind kicked up, and again I noticed fish dimpling the riffles after a gust. I tied on my black ant with a tuft of orange poly for visibility, and I caught two nice ant sippers. At this point the wind subsided, and not much was happening on the surface, although I continued to spot occasional small BWO’s in the air. I tied on a Chernobyl ant assuming that this would do double duty as an indicator and perhaps draw some rises given the wind and terrestrials in the water. I attached a light yellow beadhead caddis pupa to the bend of the Chernobyl, and then I tied a small beadhead RS2 below that. 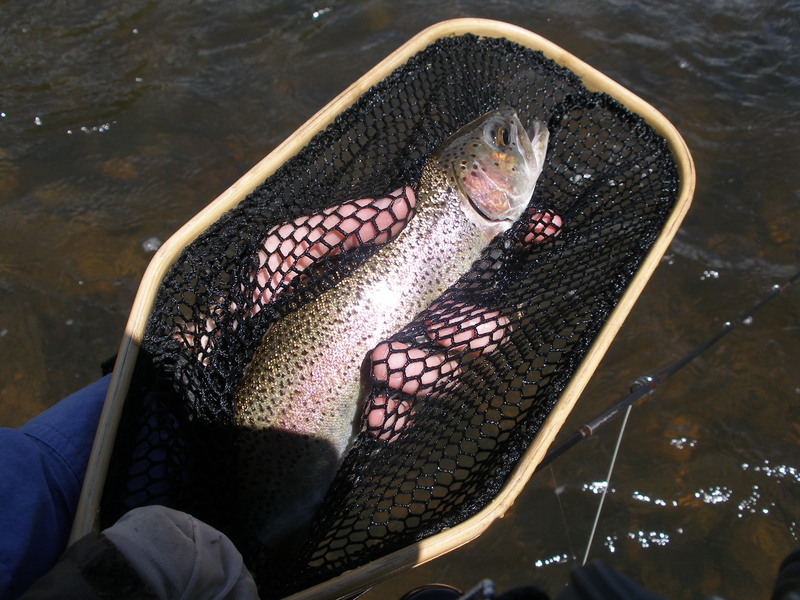 I began prospecting the water and catching fish on the small beadhead RS2. Apparently the fish were taking the RS2 for the BWO nymphs that were active all afternoon. At some point I switched the caddis out for a beadhead hares ear. During the remainder of the afternoon I caught five trout on the beadhead RS2 and one on the beadhead hares ear. The action was not as fast as during the hatch, but enough to keep me interested in anxious anticipation. I waded to the small island below the point where the group of fishermen were present during the hatch. By now only a few anglers remained, and they were not in that area. The weather changed, and the wind began to gust, so I decided to call it a day and waded back down to my entry point. I stopped and observed a young fisherman fishing the far bank that produced for me during the hatch, and he landed a couple fish. I looked above him, and I spotted a few sporadic rises among the whitecaps created by the wind, so I decided to wade in and share in the fun of fishing ants. I removed the beadhead hares ear and RS2 and tied a black ant behind the Chernobyl. I made ten casts and eventually witnessed the subtle take of a nice brown and hooked up and landed my 21st trout. As I waded out of the river past the young fisherman, I asked if he was catching fish on black ants, and he said no, PMD emergers. I caught 21 trout on an assortment of flies and only one of the fish was a rainbow.